LaViolette carefully studied data spanning the onset of the Younger Dryas cold period near the end of the ice age during which there was a progressive long-term rise in the atmosphere’s radiocarbon concentration. Although some of this 14C rise was due to changes in the ocean’s carbon reservoir due to deep ocean circulation, a large part of it was believed to be due to a real rise in atmospheric radiocarbon concentration. Studying radiocarbon data from the Cariaco Basin ocean sediment core drilled off the coast of Venezuela, he found that, at certain times in the course of this rise, radiocarbon concentration shot up sharply. The two largest 14C spurts to occur in the 4000 year Cariaco record occurred in particular during the first three centuries of this early YD period. The Cariaco Basin varve chronology dated these events at 12,837 years BP and 12,639 years BP. Interestingly, they were separated by 198 ± 9 years, or nine Hale solar cycle periods. 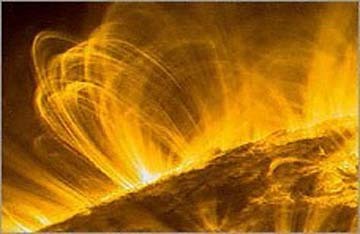 This interval also matched the 200-year de Vries solar cycle period which is believed to be one of the most prominent of the Sun’s solar cycle periods. This was the smoking gun that indicated that these spurts very likely had a solar cause. And, there were two other notable 14C spurts of lesser magnitude that preceded the 12,837 years BP event, each separated from the other by three Hale solar cycle periods. The radiocarbon increase of the two largest 14C spurts was comparable to that produced by a SPE at least 125 times stronger than the hard spectrum SPE that occurred in February 1956. Extrapolating upward from that event, LaViolette estimates that the 12,837 years BP extinction level SPE would have delivered over a two day period a radiation dose of from 3 to more than 6 Sieverts, lethal dose (LD-100) for most mammals being in the range of 3 – 8 Sieverts. Hence it could have been a principal cause of the final termination of the Pleistocene megafauna and even of several genera of smaller mammals and birds. The upper range of his estimate is a very conservative projection based on the assumption that the SPE would have been strong enough to overpower the Earth’s protective magnetic field sheath allowing the full intensity of the solar cosmic ray barrage to directly contact the Earth’s atmosphere and induce an intense shower of cosmic ray secondaries. The 1956 SPE was observed to produce a 1 percent decline in geomagnetic field intensity, so a super SPE over two orders of magnitude more intense would likely have completely overpowered the Earth’s field.